We received the below mentioned items in exchange for our honest review & giveaway. All opinions are those of our own and were not influenced in any way. I remember as a little girl playing with my dollhouse and how much I loved the realistic miniatures. My sisters and I could play with our dollhouse for hours and hours. That is one reason I was so excited to review the Calico Critters Cozy Cottage, well my nieces and their cousin, but I played with it too! We absolutely love Calico Critters timeless and classic toys and your child will too! The Calico Critters Cozy Cottage is the perfect way to start your collection! Comes with over 15 furniture pieces & accessories including Bell Hopscotch Rabbit, bed with matching sheets, square table with chairs, kitchen counter with sink & 3 storage areas, cutting board with chopping “knife”, and moveable ladder for easy access to each floor. 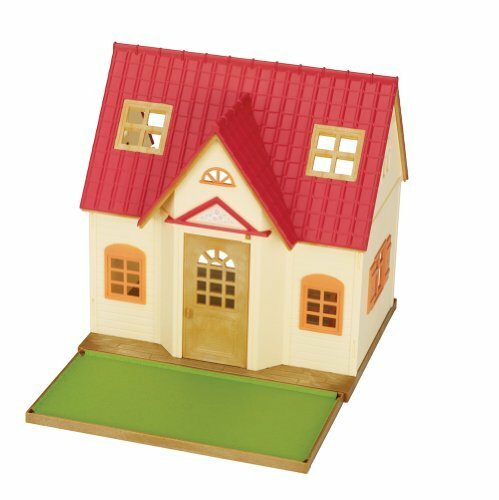 House measures 10.5″ x 8″ x 10.75″. I really like that this cozy cottage comes fully assembled and ready to play with everything you need. The girls were able to start playing right away and continued to play for hours! I was very impressed with the attention to details on the cottage and on all the accessories. The chairs and other pieces of furniture had flowery design details. The entire cottage had wonderful details like planks for the floor, window shutters, roof tile and more! Everything that came in the set felt very sturdy and will hold up over time. The cutting board and knife are small so they might be lost easily, but they can be stored in the little drawers in the sink cabinet! The front of the home is so cute and inviting! I love the flower painting above the door! This set includes the adorable Bell Hopscotch rabbit. She has jointed arms and legs, and a head that turns. The counter with sink & 3 storage areas. The details on this is great! All the drawers open and I just love the plumbing under the sink! The reversible 2nd floor is moveable so you can use it as a front lawn! The old fashioned television has nice details and cabinets that open too. Also, includes 3 reversible pictures (6 images total) to use for the tv screen. We have really enjoyed the Calico Critters Cozy Cottage set and my family will continue to cherish this toy! I know that Calico Critters toys will be a favorite toy for any child while providing hours of creative play! These award-winning miniature creatures and their life-like environments have inspired the imagination and creativity of countless children, while promoting healthy physical and cognitive development through pretend play. Calico Critter families are just like real families, and every mom, dad, sister and brother plays an important role in the Cloverleaf Corners community. Suitable for ages 3 and above. For even more information on the individual characters, their stories, roles, relationships and environments can be found at their website and check out their video. If you can’t get enough Calico Critters, engage with them on social media through Facebook, Twitter and Pinterest. Disclosure: rays of bliss was not monetarily compensated for this review & giveaway. All opinions are 100% our own and were not influenced in any way.